South East Asian cuisine, as one knows, is diverse in a rich and colourful way. Distinct sharp flavours often puctuated by the clever use of exotic spices and earthy fresh ingredients have come to depict the identity of SE Asian cuisine to many. Needless to say, gastronomy nostalgia for me, with my Singaporean roots, will always have to involve food or ingredients that transport me back to the region. Dessert will always be a category that grips many and for many of us who reside in the South East Asia, Kuih, those bitesized snacks that come in a myriad of textures, colours and taste will always evoke fond memories and comfort. 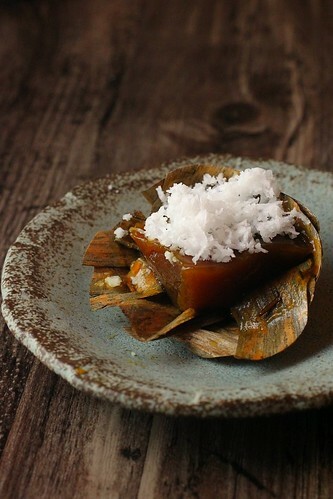 Common ingredients for Kuih include coconut products, root vegetables such as tapioca or sweet potato, rice flour (SE Asia's staple carb component) and.... Gula Melaka (palm sugar) which transforms our sweets further with its exotic sweetness. Commonly used in Malaysia, Thailand and Indonesian cuisine, the palm sugar resembles brown sugar but has a more distinct caramel or butterscotch like flavour. The palm sugar, being more accessible and cheaper than refined white cane sugar was very often the sweet note on the simplest desserts such as sago pudding, coconut milk based chendol and in this case, the no frills, straight forward rice cake, Kuih Kosui. I have to admit that Kuih Kosui has never been my favourite kuih but it is possibly the one that best celebrates the flavours of palm sugar. 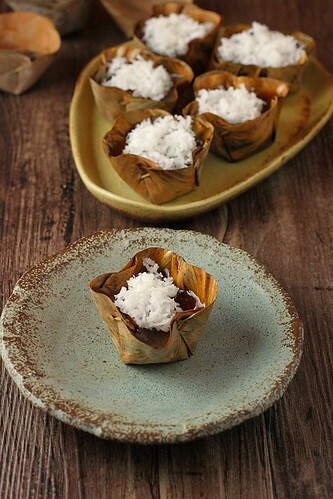 Commonly steamed in a tray and cut into rectangular slices to be coated with grated coconut, there are others who also steam these in little cup molds. 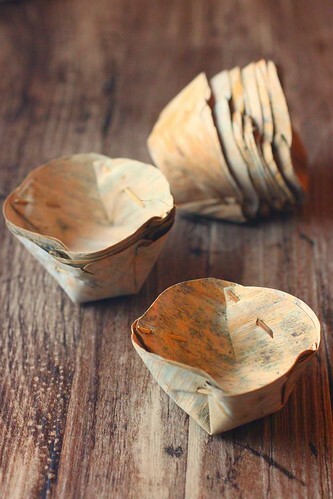 I have decided today to try to work with these little leaf cups which I had bought at a wet market in Chinatown, Bangkok. However, I must admit regret in dressing up the kuih in these cups for the the dried leafy cup carries with it a scent that I feel do not meld with the palm sugar. Overall though, this is definitely one classic dessert which sets off the sweet exotic flavours of Gula Melaka in an honest, earthy manner and for many of us who hail from the region, I have no doubt that it will bring back sweet dessert memories we grew with. 1. In a heavy saucepan, place palm sugar and water. Heat up to dissolve the palm sugar. Add castor sugar, and continue to heat until sugar dissolves. 2. Add Alkaline water and Rice flour and Tapioca flour and mix well. 3. Return the saucepan over the stove and over low heat and with stirring, cook the batter until the batter starts to become a thicker flowable batter. 4. In a spearate pot, heat up water to prepare for steaming. 6. Steam (5) over high heat for about 15mins. 7. Cool down and garnish with salted grated coconut. Love love love the look of the leaf cups. Perfect for this kuih. They go really well with your rustic wooden background. Beautiful clicks, Shirley. Those look so pretty...! I used to eat such kuihs too when I was younger, very yummy :D)! I like this kueh perhaps becoz of the palm sugar but definitely will taste nicer if minus the coconut. hahah..
Love your presentation. Hard to make those banana leaf cuppies? You use the leaf to present this kuih, look so beautiful like Japanese dessert. 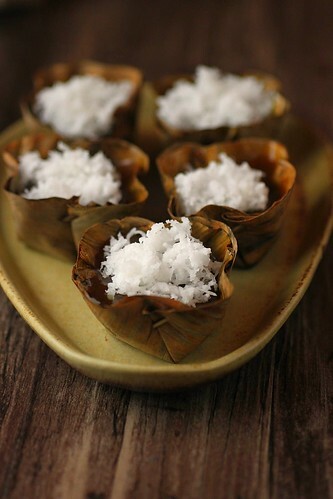 Delicious looking kuih kosui with those special leaf cups! This kueh is my hubby's favourite. Been pestering me to make it for him. Love your presentation! @Edith, I did not make the cups. I bought them in Bangkok and I am a little clueless what leaf this was made from. It would have been better if these are made of banana leaves. oh..I love those leave cups and kuih kosui are very delicious. Hi again, I have an award for you, please pick it up whenever you have the time :). Oh gula melaka is cheaper than white sugar in Spore? Gula melaka is definately pricier over here. Almost triple! @Wendy, castor sugar here is SGD 2.50 per kg. Traditionally it makes sense that gula is cheaper than refined sugar. Malaysian government did not subsidise gula? Anyway, I paid a dollar for about 600g of gula at the market here. I can't get gula melaka here so I used the Indonesian gula jawa. They tasted similar but very much darker. I always like dessert made from gula melaka. This kueh is one of them. First time seeing those cute cuppies. U managed to make this kueh look soooo gorgeous!!! I have been eyeing more kuih recipes to try recently, just get to get my head around! I'm would love to have one of the kuihs now! Shirley, the kuih kosui looks so good and I never knew they could look so elegant as well. Love the leaf cups and it makes the whole presentation really stand out. Beautiful leave / cups.. everything loooks so rustic and comforting ..
Love your celebration of gula melaka here, we often forget the little things that makes our regional food experiences so special. Back in Malaysia we get gula melaka in very dark flat discs wrapped in leaves. I like gula melaka in onde-onde and also in a coconut milk agar-agar my mother used to make. Now this post has inspired me to look up that recipe from her. Thanks Shirley! Oh I love the fluffy white topping compared to the dark yummy looking insides. Glad you show us a glimpse in one photo. Adorable presentation with the leaf cups, too! Yea, agreed with Wendy! Gula Melaka is pricier than regular sugar, especially the good one. I don't buy the ones on supermarket shelves. My mom and I always stock up on the gula from Melaka. 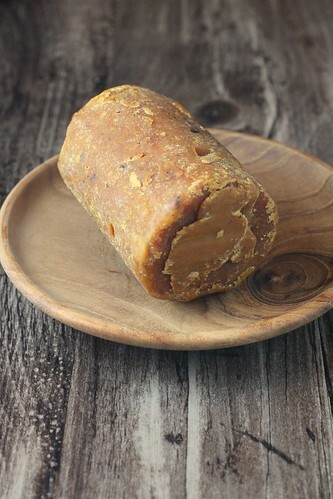 Pure, quality gula is very soft and melts even at room temperature. It's VERY DARK in amber color, too. Intensely flavored. I like the cups! This is not my favourite kuih either, but you can really taste the flavour of gula melaka. Yummy! Love the 2nd photo. Great composition. beautiful photo Shirley! I don't grow up with kuih but my husband's family is crazy about 'em! i LOVE gula melaka and anything that goes with it though interestingly Kuih Kosui never really runs high on that "to-eat" list. one tip I picked up from the peranankan cooking series "Ways of a Matriach" was to ""pre-heat the cupsby leaving them to "steam" over boiling water for a few mins prior to pouring in the paste. this helps to prevent the kuih from sticking to the cups too much. Hope it helps! lovely kuih kosui. more coconut with it is the best! I have never seen any dessert like this before but it looks fantastic! The photos are just gorgeous. the cups and rustic styling is so beautiful! i had some of these outside the "niu che shui" market in Singapore when i was touring there last year! it was so good and we asked for more coconut since it was so delish!!!! by the way, i'm not sure if you do these things but, i have given you a blog award, please come to my blog and claim it if you have time.